From 1794 to 1890, an ever-shifting coalition of state legislators, town select board members, surveyors, scientists, entrepreneurs and even ultimately the Federal government placed Massachusetts at the head of American mapmaking. There is no one explanation for Massachusetts’ cartographic leadership, but there are some underlying factors: A robust scientific community, an activist state government, the New England township model, a culture of entrepreneurship, and a capacity for public-private collaboration. Massachusetts’ cartographic leadership was embodied in three seminal maps of the state. After the Revolution Massachusetts was in dire need of an up-to-date state map. This was necessary for stimulating commerce and infrastructure development, delineating public lands available for sale, and allocating taxes. With a weak Federal government unable to provide support and itself short on cash, the State had to come up with creative models for funding these labor intensive projects. In 1794 the legislature enacted a clever map-making project designed to shift the costs away from the State. Each town was required to conduct a survey at its own cost and submit a town plan to the Secretary of State. These were to be at a scale of 1 inch to 200 rods (1:39,600); indicate the length and bearing of town boundaries; delineate roads and waterways; and show the locations of meeting houses, schools, mills, mines &c. Under state auspices, the surveys would then be compiled and where necessary reconciled to produce maps of Massachusetts as well as Maine, which remained part of the state until 1820. These surveys were conducted by the centuries-old metes-and-boundsmethod. Using a compass for taking bearings and a rod (16.5 feet) or chain (66 feet) for measuring distances, surveyors worked their way in a continuous path along a town’s boundaries to be measured, recording bearings and distances between objects designated as boundary markers. 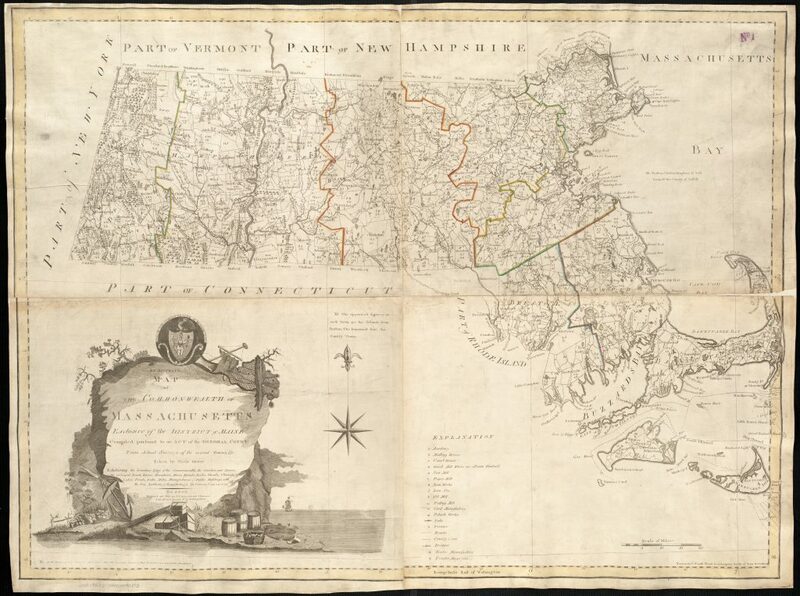 The hundreds of resulting maps were of varying quality and ridden with inaccuracies, and only with much difficulty were they compiled by Boston mapmaker Osgood Carleton into An Accurate Map of the Commonwealth of Massachusetts and Map of the District of Maine (1797). Though poorly engraved and difficult to read, these were an informational tour de force, as they depict the state at a level of detail hitherto unimagined scale of 1:253,440 (Mass.) and 1:400,000 (Maine). Osgood Carleton, Accurate Map of the Commonwealth of Massachusetts. Boston, 1797. Image courtesy of Norman B. Leventhal Map Center. By 1829 Carleton’s maps were obsolete, due both to its intrinsic failings the original surveys and to the rapid pace of development in the State. So in 1829 and 1830 the legislature passed enabling legislation and commissioned Simeon Borden to produce an entirely new state map. This was to be essentially a three-stage process: First, as in the 1790s each town was to survey its territory and submit a map to the State (Incidentally, nearly 100 of these towns were published, such as these maps of Amherst, Hingham and Leominster. Second, a statewide “geodetic” survey would be conducted, in which superb instruments and rigorous astronomical observations were used to establish a baseline from which could be developed a network of some 500 triangulated reference points across the state. Finally, the local data in the individual town maps would be reconciled and merged with the trigonometric survey to produce the state map. This was to be the first map of any state to be based on triangulation from geodetically-controlled points, though it reflected advanced map-making practices long in use in Europe. The project was hindered by numerous difficulties, above all the uneven quality of the town surveys. Principal Engineer Borden later wrote that he “found the town maps which had been returned to the Secretary so incorrectly drawn as to render it impossible, in their actual state, to make a satisfactory map from them.” In light of the resulting rework, the Topographical Map of Massachusettswas not published until 1844. This was a giant leap forward over Carleton’s map and any other state map in existence, in terms of both accuracy and scale (1:158,400). It offers enormous detail, including roads and railroads; significant landmarks; and even in some areas individual dwellings and public buildings. Symbols differentiate the varied topography of hills, ponds and lakes, and marshes and swamps. The map’s visual appeal and informational value are enhanced by inset climatological and geological maps of the state. Simeon Borden, Topographical Map of Massachusetts. Boston, 1844. Image courtesy of David Rumsey Map Collection. In the early 1880s the U.S. Geological Survey (USGS) initiated a national “topographic” survey—that is, a survey incorporating the measurement of elevations as well as latitude and longitude. Massachusetts, with its long history of cartographic excellence and where just such a survey had been advocated as early as the 1850s, was selected as the first site. The work was implemented and funded through a pioneering federal-state partnership, with the federal government agreeing to pay half the cost up to $80,000 and the whole cost beyond, the whole overseen by pioneering map maker Henry F. Walling. 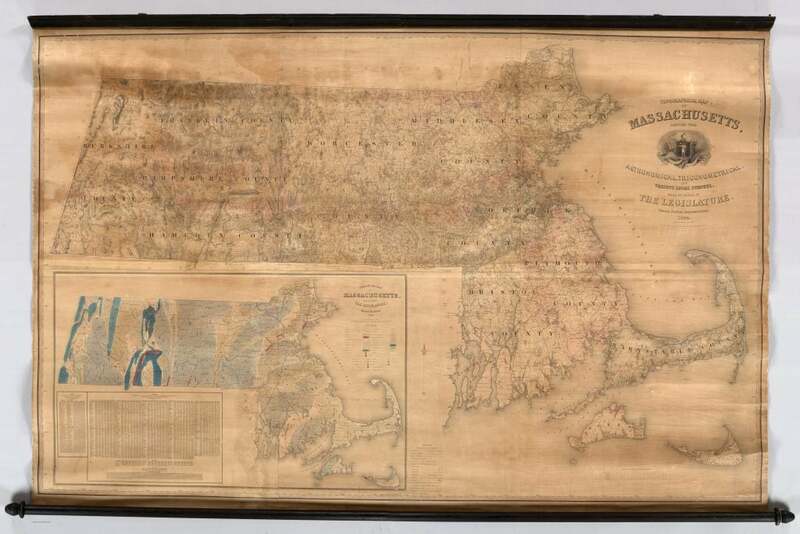 The survey included all 8,315 square miles of Massachusetts and the adjoining portions of New York, Vermont, New Hampshire, Rhode Island and Connecticut to complete certain atlas sheets. The project was a milestone in the expansion of federal government activity into state affairs, particularly in areas where federal funding and technical resources were essential to catalyzing action and providing a likelihood of success. It employed as its framework the geodetic surveys conducted by Simeon Borden and over several decades by the U.S. Coast Survey. The results of the topographical survey were first published in preliminary form in 1890 as the Atlas of Massachusetts,the first topographical atlas of any state. The Atlas is a masterpiece of clarity and detail, benefiting from the large scale (1:62,500), superior draftsmanship, and the judicious use of color to delineate different categories of information. The most distinctive feature is the use of isometric contour lines (in brown) to show elevations at intervals of 20 feet. Editions issued later in the 1890s added data such as city and town boundaries, as well as the locations of dwellings in the less-populated countryside. For a view of the atlas in its entirety, visit this page on the Library of Congress web site. This is a slightly revised version of an article originally published in the newsletter of the American Geographical Society. Simeon Borden, “Account of a Trigonometric Survey of Massachusetts…,” Transactions of the American Philosophical Society 9, n.s. (1846): 34. Quoted in Walter Ristow, American Maps and Mapmakers, 1985.